George Bernard Shaw: The playwright used this postcard to respond to unsolicited mail. This standard “decline” postcard was one of many that George Bernard Shaw used over his years as a public figure. The playwright and critic, who had a long and successful career, wrote on controversial topics (socialism, education, feminism, the class structure, pacifism, vegetarianism). As a result, he received a lot of unsolicited mail. Form postcards helped him handle that load. With this 1948 card, the 92-year-old Shaw begs the reader to realize that he is growing older, his audience is large, and “war taxation has set narrow limits to his financial resources.” (With this last, Shaw infuses even this bit of ephemera with his pacifism.) Therefore, he can’t give anyone money, advise young authors, write back to strangers who write him long letters, or accept visitors he doesn’t already know. 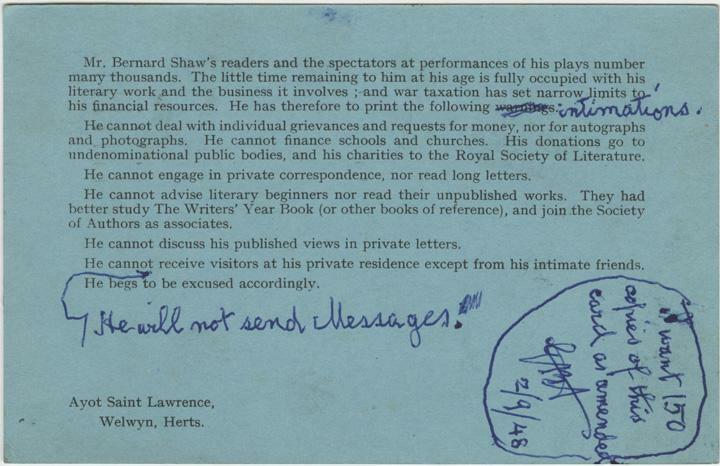 In his handwriting, Shaw has edited this draft so that its language is slightly less harsh (he replaces “warnings” with “intimations”), and requested 150 copies of the amended card. Richard Oram, associate director and Hobby Foundation librarian at the Harry Ransom Center, writes that Shaw’s papers at the center contain an entire folder of these postcards, in different colors, many annotated in Shaw’s handwriting. Shaw wasn’t alone in his practice. Oram writes that many authors whose papers are at the center, including Evelyn Waugh and Marianne Moore, used similar form response postcards. Thanks to Jennifer Tisdale of the Harry Ransom Center, The University of Texas at Austin.